The Buck Compadre Axe was designed and engineered for the outdoor enthusiast. This tough, hard use camp axe is built out of 5160 spring steel upgraded with Cobalt Cerakote coating and rugged natural canvas Micarta handle scales. 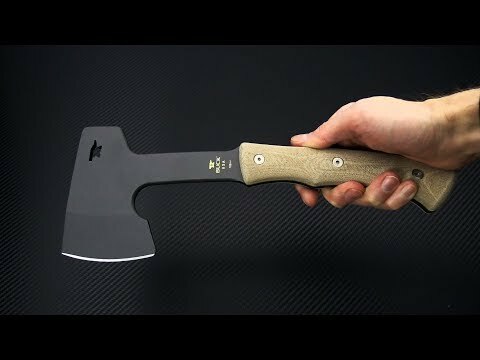 This packable woods axe handles the tasks where a knife just won't cut it. The Compadre Axe is back with a new style but the same great performance. Brand new, direct from Buck Knives. Head: The head of the Compadre Axe is forward weighted for more efficient chopping with a thick grind to help with splitting while the relatively thin stock allows for fast work on smaller materials. A subtle beard allows the user to grip the axe near the head for fine work when you are not ready to switch to a smaller tool. 5160 spring steel is tough with good edge retention and the Cobalt Cerakote coating offers corrosion resistance and a discreet, non-reflective finish. Handle: Heavy duty hardware attaches the contoured, natural canvas Micarta handle scales to the full tang blade. The handles are simple, durable and comfortable with good traction and subtle swells that make allow for controlled use in one- or two-handed chopping. Carries via the included black leather belt sheath with stainless steel ring. 5160 Carbon Spring Steel: 5160 Alloy Steel, also sold as AISI 5160, is a high carbon and chromium spring steel. It offers excellent toughness and high ductility. 5160 is commonly used in the automotive industry in heavy spring applications, especially for leaf springs. Chromium is added to increase hardening response and performs well in a wide range of Rockwell hardness. It can be hardened up near the 60s for knives needing more edge holding.